XT60 connectors can be used to make reverse polarity mistakes a non-factor! 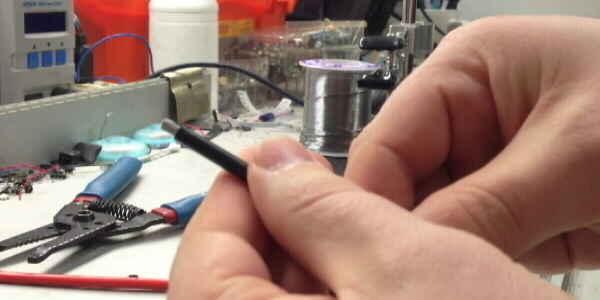 This tutorial explains a quick an easy way to solder wires to the connectors. See more about eliminating reverse polarity mistakes with the XT60 connector here! Strip approximately a quarter inch of insulation from one side of each wire (black and red). 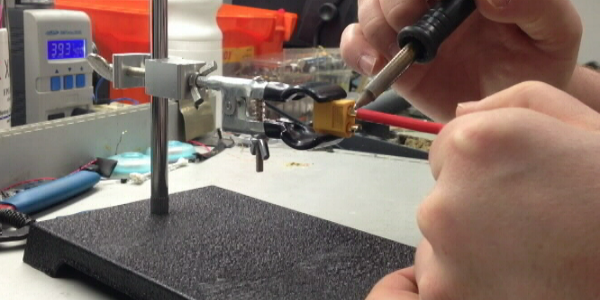 Use the soldering iron to melt solder on the exposed metal of each wire. This process is called Tinning. 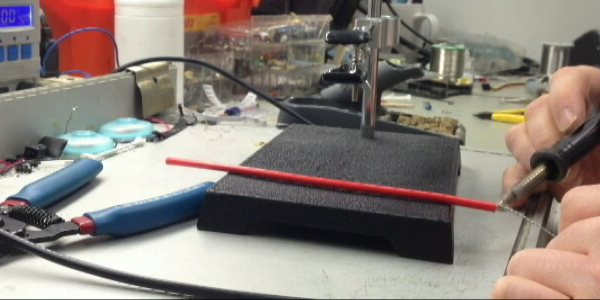 Using the cutting tool, cut two pieces of heatshrink 1/2 in. to 1 in. in length. It is important that your cuts be straight to avoid exposed metal in the future. Slide one piece of heat shrink on each wire. Place the XT60 Connector in the mounted clamps so that the marked positive (+) side is up. 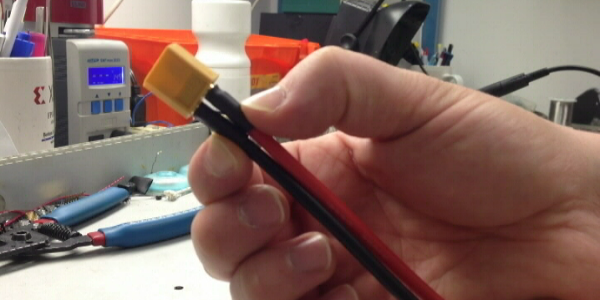 Before performing the next step you must realize that the connector will retain heat for a short period of time. Do not touch the connector until you are sure it has cooled down! It is best to hold the wire at a safe distance from the heat but with enough control to maintain the position of the wire until the solder has solidified. Using the soldering iron to melt solder in the positive connector solder cup. The solder will flow into the connector once the proper temperature is reached. 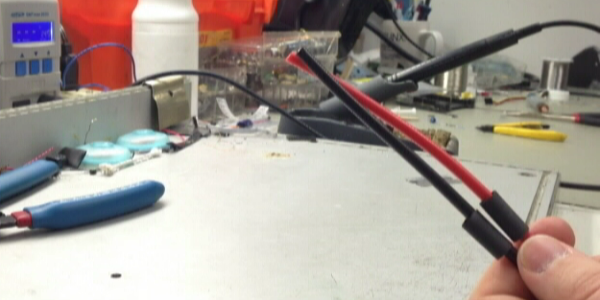 While the solder is still in liquid form, place the tinned end of the red wire into the positive connector solder-cup. Quickly put the soldering iron over the tinned wire. 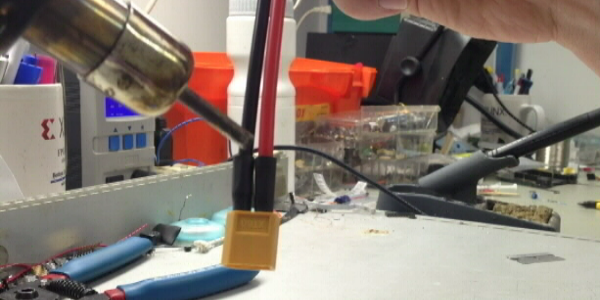 You will see the solder on the wire liquefy and merge with the solder in the connector solder cup. 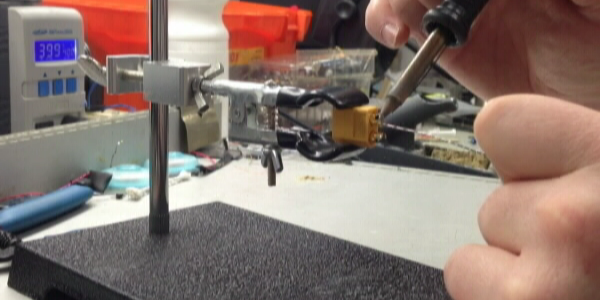 Once the melted solder has made connection, remove the soldering iron and place it in the holder. 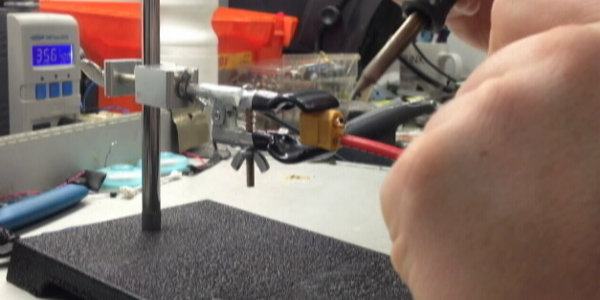 Be sure to keep the wire in position until the solder has solidified. Wait approximately 30 seconds for the connector to cool down. Note that this time may vary depending on soldering skill. If it takes a long time for the tinned solder of wire to merge with the connector, it take longer for the connector to cool down. Once the connector has cooled enough to comfortable touch the XT60 connector, loosen the mounted clamps and turn the connector 180 degrees so that the marked negative (-) side is now facing up. Tighten the clamps. Using the soldering iron to melt solder in the negative connector solder cup. Again, the solder will flow into the connector once the proper temperature is reached. 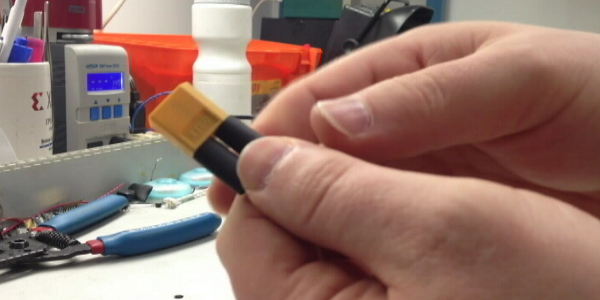 While the solder is still in liquid form, place the tinned end of the black wire into the negative connector solder cup. Quickly put the soldering iron over the tinned wire. You will see the solder on the wire liquefy and merge with the solder in the connector solder cup. Again, wait for the connector to cool before touching it. Only then is it safe to loosen the clamps and remove the XT60 connector with both the red and black wires now attached. Slide the heat shrink pieces against the connector. 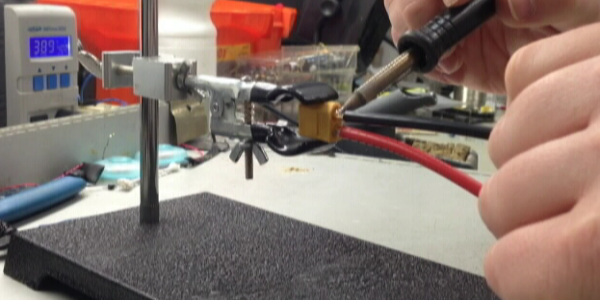 Use the heat gun to warm the heat shrink. Once the proper temperature is reached, the heat shrink material will conform to the shape of the wire and connector. Now you have an solid insulated connection between your wires and connectors. If metal is still exposed, you may want to use a piece of electrical tape or a larger piece of heat shrink that will just fit over the connector to cover any exposed conductive material.